on january 22 1984, apple computer broadcast an advert during america's superbowl that challenged the perceived might of ibm with the introduction of the macintosh computer. arguably, this was the true advent of the personal computer in the shape of a small, beige box with an off-centre disk-drive for a mouth and the word 'hello by way of a welcome. it's icon rich interface, inspired by a visit to xerox' palo alto research centre by messrs jobs and wozniak dispensed with the flickering command-line exeprienced by ibm's dos users. they had thought different. the '1984' superbowl movie attracted a cease and desist letter from the estate of george orwell, contending that its basis on the latter's novel, written at barnhill on jura, was an infringement of their copyright. but in 1995, it was added to the clio awards to its hall of fame, while advertising age placed it at the top of its fifty greatest commercials. if you were there, so to speak, it's a product launch that is still recalled today, one that has endured in spite of apple's varying fortunes over the years, even amongst those who'd never used a computer or read george orwell's book. there have been a number of product launches since 1984, that, despite the encroaching insidiousness of advertising technology, and a concomitant increase in advertising spend, have failed to fix themselves in the minds of the great unwashed. however, the commencement on saturday 6 august of this year's olympic games in rio de janeiro, has arguably produced a similar memorable result for specialized bicycles, at least within the cycling world. 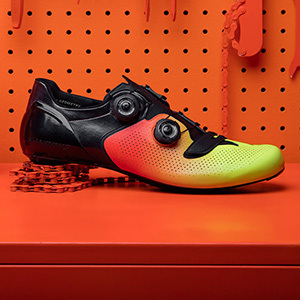 i am of course, referring to their torch range of bicycles, clothing, shoes and helmets, officially launched the previous tuesday, but quite literally brought to light in both the men's and women's road races. the reason for the specialized torch bicycle frames inhabiting a higher profile than those under the saddles of their competitors is their inherent ability to change colour depending on the ambient temperature. 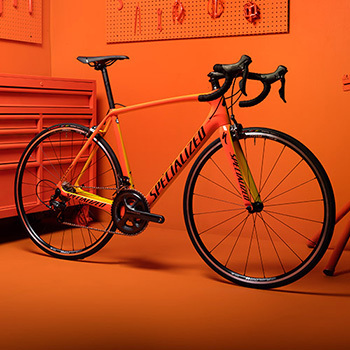 as specialized's ron jones explained; "The color change paint it is a thermochromic pigment that changes from opaque orange to clear at 22 degrees celcius, a transition that reveals the underlying paint which is a neon yellow. This technology has been around for a long while, but I have been experimenting with it for about three years now, testing it on various co-workers bikes." "The search for creative ways to decorate our products led me to a YouTube video featuring a car that changed color based on temperature. With some additional research, I found the pigment supplier and ordered some to sample in our Morgan Hill paint lab; we knew it could be something cool and special for the 'Torch' collection." 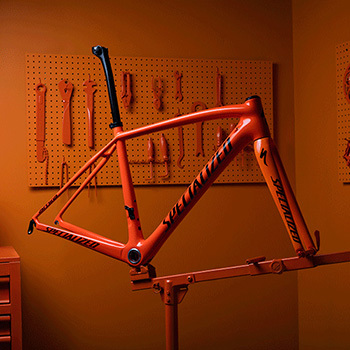 with the majority of specialized bicycles and frames built and assembled in taiwan, in common with most of today's carbon, i wondered whether the only frames receiving the torch treatment were perhaps being painted in california. "The photochromic pigment is a challenge to apply as it turns clear above 22 degrees celcius. Since our paint lines are all next to the drying ovens it is very difficult to see the paint without some innovative application techniques. For this reason it requires automated spray equipment and other processes which only our factory in Taiwan can currently offer us." after this past weekend, when the ride of the falling rain fulfilled every centimetre of its promise, i spuriously queried specialized as to whether we could order a batch of frames that altered colour depending on the pervasiveness of the rain. i was, it ought to be said, only half-joking, but as ron says; "There is some interesting chemistry for various ways to create color change, but in the case of the 'Torch' collection we are using Leuco dyes in the form of microcapsules that encase the color changing pigments. When warmed, the dyes' chemical construction alters from absorbing most spectral colors to absorbing all spectral colors." that pretty much takes care of the technicalities, but if the thermochromatic paint starts to change at 22 degrees, when does it stop? does it eventually turn white? "(It) turns completely clear on reaching 29 degrees. When the frame cools below the 22 degree threshold, the top coat returns to its original state, thus changing the color of the frame. "This creates a really dynamic finish which can be affected by hot and cold, as well as wind and moisture evaporation. Our goal was to have each frame look slightly different throughout the different conditions encountered. 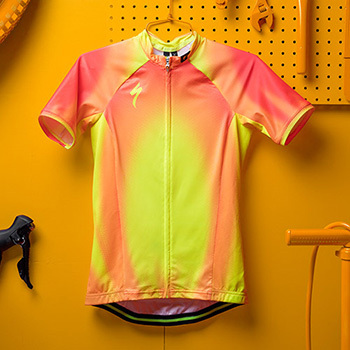 "If the rider is climbing in the sun, the frame should change to the high temperature color (for the Torch this is Neon Yellow). 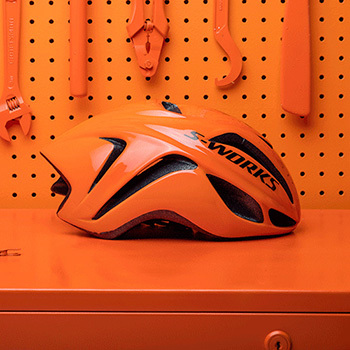 If the rider were to spill water or drip sweat onto the frame, the evaporative cooling effect should change the frame color back to the cool temperature color of Moto Orange. Additionally, if the rider is descending at speed, it is possible to have the leading edges of the frame cool down while the trailing sections stay warm. This can create a really dynamic and unique color effect for the bikes." as mentioned above, the torch range includes not only the carbon frames (tarmac, amira, epic) but has been also applied to helmets and shoes. perhaps the most obvious result of this was on specialized sponsored riders in yesterday's olympic time-trial, where the top of those aerodynamic helmets were quite demonstrably neon yellow, fading to moto orange at the front and sides, proving, if nothing else, that much of our body heat escapes from the top of our heads. various shades of yellow could also be seen on the occasional item of specialized footwear. it was also easy to note that wednesday's temperature in a wet and blustery rio were below 22 degrees; not one of the time-trial bikes altered from that highly attractive, deep orange to the bright yellow seen on the weekend's road races. "We made a take-down color across models that had the look of the color-changing, but doesn't actually change. We made S-Works level bikes that do change color. They come with a condition that the effect of the paint will end depending on conditions. The expected lifespan is a minimum of 600 hours." while in conversation with ron jones regarding the technicalities of the torch range, i made mention of the possibly related fact that the very brightly coloured specialized crux elite cyclocross bicycle currently in for review had featured a tag on the seatstay stating that the fluorescent orange/red covering the majority of its carbon frame ought to degrade to a darker red under continued exposure to daylight. is this in any way related to the olympic bikes? "No. The color change mentioned in the tag is a symptom that all neon colors share. UV rays from the sun can change the appearance of really bright colors over time. 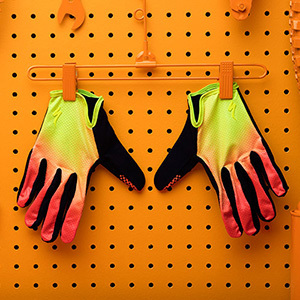 The tag is to notify the customer that we have specially formulated our neon colors to darken or 'tan' over time, rather than bleach-out like some of our competitors' frames. We felt it was better to acknowledge the changes neon colors go through than to ignore it and act surprised when the customer complains their frame has turned white." ultimately, is it all worth it? in a world of bicycles at one time more obsessed with offering matt black, unpainted carbon frames, isn't the notion of painting them with colour-changing stuff just a bit on the superficial side? maybe it is, but amidst the seriousness often attached to the upper regions of the sport, it behoves us well to remember that it is, in fact, simply entertainment. were this not the case, we'd all have found far more interesting things to do during those three weeks in july and we'd have done the weekly shop on saturday rather than watch the men's olympic road race. 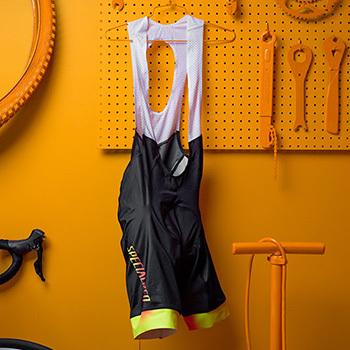 granted, it would be naive to think that our lycra-clad heroes think of their careers in similar, light-hearted fashion, but they're on the inside, while we look on from the outside. thus any highly visible addition to the panoply, within reason, ought probably to be welcomed with open arms. apple took advantage of several million pairs of eyes watching the 1984 superbowl to introduce their ground-breaking computer, so other than one or two team managers who ought to know better, who can blame specialized for employing a similar tactic to draw attention to their bicycles? to borrow a concept from a related source, it's really all about marginal gains, wherever they might be found. in my opinion, this is a darned good one. very many thanks to slate olson, ron jones, sean estes and breanne molloy of specialized bicycles for answering my questions when they should have been enjoying a weekend off.